Company Name: Tefco Aomori Co., Ltd.
A truly unique company with unique technology to electrodeposit numbers and letters on the dial index of watches. Using electrolysis formation techniques to create letters and numbers on the dial index of wristwatches, Tefco Aomori is the recipient of international patents, boasting a large share of the global market. 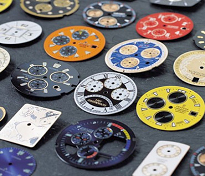 Tefco Mirror for watch is the world-first transfer-sticker type of watch dial index. It is the metallic individual letter, which is mass-produced by Tefco original electroforming technique. The base material is nickel. A variety of color and finish meets all watch designers’ demands in the world. Product thickness is 0.03mm ~ 0.150mm available. Minimum line width is 0.1mm ~ 0.20mm. Tefco original pressure sensitive adhesive enables no glue bleeding around the dial index when it is attached. Supply approx. 7 million units a year with watch manufacturers over the world, especially for upmarket watch products. 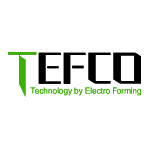 The world-first transfer-seal type of metallic individual letter logo, which is mass produced by Tefco original electroforming scheme. The base material is nickel. A variety of color and finish is available. It is made of metallic yet looks rounded. The standard thickness is 0.05mm. Minimum line width is 0.20mm. Firmly attached by original hot-melt adhesive. Special attachment equipment is required. Tefco has intellectual property which regulates placing metallic individual letter into the recess of customer’s product surface, which prevents end user from potential cutting accident. This technical patent is registered in 4 countries such as Taiwan, Korea, China and Japan.